The Internet has transformed numerous industries and created new markets. In the next phase of development, the Internet is set to do much more. Industry leaders predict that the number of Internet-connected devices will surpass 15 billion nodes by 2015 and top 50 billion by 2020. 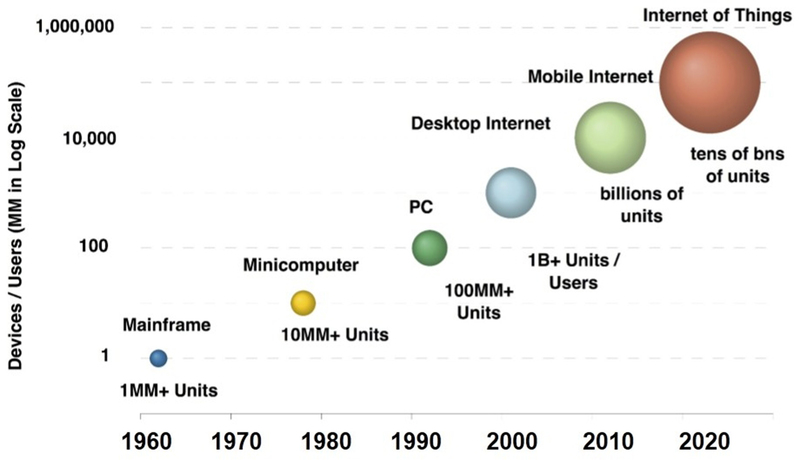 Most of these connected devices will not be traditional PCs, servers or even smartphones but smaller, cheaper, simpler embedded devices. This growing web of connected devices – known as the Internet of Things (IoT) — includes smart phones, tablets, TVs, gaming consoles, home appliances, security systems, smart thermostats, smart meters, personal fitness trackers, portable medical devices, smart watches, vending machines and numerous other products. There is admittedly a cool factor to many IoT applications. Consider the profusion of Apple iPhone apps that allow users to remotely monitor and control security, HVAC and lighting systems with the stroke of a touchscreen. The majority of connected devices for the IoT are nodes located at the so-called “last inch” of the network. Using microcontrollers (MCUs) as the programmable “brains” of the IoT, embedded sensors and actuators serve as its virtual eyes, ears and fingers, monitoring and reacting to changes in temperature, humidity, light, physical intrusions and other environmental conditions. M2M connectivity, rather than continuous end-user interaction, is vital to the IoT. 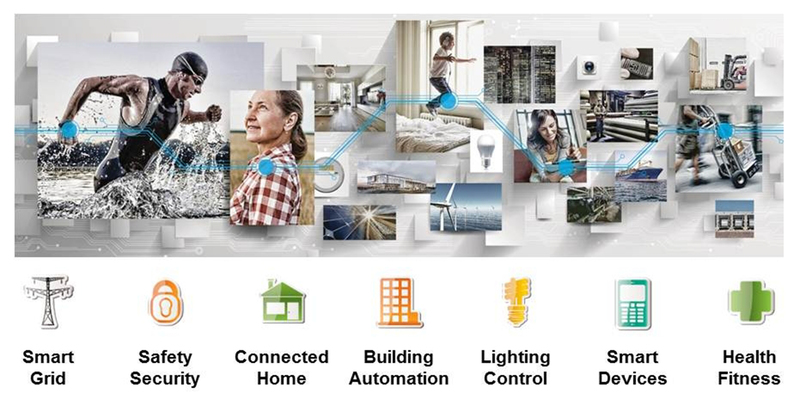 The distributed intelligence of the IoT can unlock the power of M2M connectivity, using the many virtual interconnections between devices to provide real-time data about our energy usage, security alarms and lighting systems. Connected devices can act autonomously on our behalf either through direct communication with each other or interaction with a smart gateway or cloud computing resources. Connected devices can also be controlled by end users using smart phones, tablets, PCs and device interfaces. The deployment of wireless sensor networks that detect temperature, motion, humidity, light or glass breakage within smart homes tap the power of the IoT to enhance our convenience, safety and security. The sensors of a home security system, for example, can be used for other smart home applications, such as a digital lighting system that automatically turns on lights when someone enters a room and then turns them off when no one is present. Using the IoT, intelligent devices can monitor their own operating health and notify users or OEMs of potential issues. For example, a dishwasher may exhibit a recognized wear pattern. If addressed early by a parts swap or changes to the control algorithm, it is possible to avoid an outage and improve overall reliability, thereby reducing the number of warranty service calls. When connected devices can be managed over the Internet, end users enjoy greater flexibility in controlling their smart systems and equipment. A control application can run on any smart phone, tablet or computer from any geographic location. By choosing a consistent user interface for the control application, the user does not need to learn new commands for each new function. And the application makes it possible to provide sophisticated interfaces for devices that traditionally have had only a few buttons and LEDs. The power of the IoT means opportunities for companies in every industry (see Figure 2). Although a security company might find it difficult to expand its reach into the lighting and home automation markets, it could instead partner with established lighting and home automation vendors to create value-added services. This is the power of the emerging IoT ecosystem, which enables electronic component suppliers, software vendors, OEMs and service providers to focus on their core competencies and leverage the strengths of partnerships to create compelling applications for end users. An understanding of power efficiency is critical to IoT application development as many connected devices must often operate using energy harvesting sources or run on batteries for months or years without maintenance or battery replacement. In addition to power consumption, connected device developers must consider factors such as system cost, component count, MCU performance, system size, standards, interoperability, security, ease-of-use and in-field troubleshooting. Adding wireless connectivity to remote devices not easily reached by Ethernet cable or powerline communications is another IoT design challenge that can be addressed by embedded developers with RF expertise. There is no one wireless or wireline technology that can serve all IoT application needs across an entire network. To develop cost-effective IoT products, engineers must select the optimal wireless technology for their application. As a result, the IoT will be based on a variety of wireless protocols. For devices to be able to reach out across the Internet, they will also need to support Internet protocol (IP) along the communications channel. Although Wi-Fi natively supports IP and works with smartphones, tablets and PCs, it consumes too much power for battery-powered connected devices. For low-bandwidth applications that do not require direct user interaction, 2.4 GHz ZigBee (an open wireless protocol pioneered by the ZigBee Alliance), Bluetooth Smart and sub-GHz radio technologies provide low-energy wireless links that are easily integrated into embedded systems. For simple applications, such as garage door openers or systems requiring long-distance connectivity like irrigation systems, a sub-GHz radio provides an optimal approach. If two-way communication, security or a large number of devices need to be connected in a mesh network, ZigBee offers a robust wireless solution. As it expands, the IoT will continue to open new markets and drive new opportunities for component and software suppliers, product manufacturers and application developers across all industries. The IoT has become a tangible reality with commercially successful deployments in several markets, including smart home, security and smart energy applications. The fundamental technologies, products, software and tools necessary to create efficient, ultra-low-power connected devices for the last inch are available today. In coming waves of IoT development, we’ll see the aggregation of connected devices into truly smart homes, smart factories, smart grids and smart cities. CEO Tyson Tuttle joined Silicon Labs in 1997 and helped design the company’s first product, a silicon DAA that subsequently achieved market share leadership in PC modems allowing the company to go public in 2000. He also spearheaded the development and market penetration strategy of the company’s successful radio and TV tuner ICs, creating the broadcast business that today represents about one third of the company. He took over as chief operating officer in 2011 with responsibility for the company’s business units and R&D, and he became CEO in 2012. Mr. Tuttle holds an M.S. in electrical engineering from UCLA and a B.S. in electrical engineering from Johns Hopkins University. He has 61 patents issued or pending in the areas of RF and mixed-signal IC design.